Teacher: Here's the jam track for the lesson sample. You will later practice the licks over this jam track. Teacher: This rhythm starts with some lead-in notes that use the D Major scale. The D chord has an alternating bass pattern and then playing the notes of the chord. You shift to G and then playing an ascending riff. You then repeat the pattern till the end of the phrase. The ending phrase uses a descending note pattern in the D Major scale as well. Let's get into the licks. You will be using the D Major Pentatonic scale. Teacher: Here's the first lick. Teacher: Notice you play various double-stop and triple-stop combinations. The lick stays within the scale pattern I gave you earlier. fatty: Should we finger pick this? Teacher: Fatty, excellent question, yes if you can, I use a hybrid finger-picking technique. Here's a picture. Teacher: Notice how the 3rd & the strings, while the 1st and 2nd fingers cover the 1st & 2nd strings. 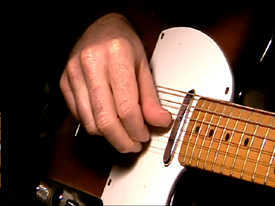 This picking combination allows you to skip strings and play notes at the same time. Here's the next lick. Teacher: Notice how the 3rd finger shifts strings in this lick. The 3rd starts on the 2nd string while bending, and then moves to the 3rd string while playing more bends while the 4th finger barres the 1st & 2nd strings. Here's the next lick. Teacher: This lick uses notes outside of the D Major Pentatonic. You use more notes in the D Major scale in this case. Notice the double-stop bends on the 1st & 2nd strings. Here's the next lick. Teacher: This lick uses more triple-stop bends. Notice later how you shift the triple-stop down one whole-step and then ascend using a chromatic pattern while playing the same triple-stop lick. Here's the next lick. Teacher: This lick uses the lower pattern of the D Major Pentatonic and take advantages of the 5 chord of the progression (A). fatty: Is this muted? Palm mute or something? Teacher: Fatty, yes use the palm muting and finger-picking technique. Notice in the lick how the 3rd finger is positioned for the slides in the 2nd bar, this allows you to move quickly to keep the lick flowing. Here's the next lick. Teacher: This example is a common blues country-blues turnaround. You start with the D root note and then ascend the scale pattern until you resolve on the D again. Here's the next lick. Teacher: This example is a bit tricky, using the finger-picking will help. Notice how you skip notes and then descending using the other notes of the scale. Here's the next lick. Teacher: This lick has a cool descending pattern on the 1st-3rd strings. You later hammer using a double-stop, and then end with a double-stop bend. Here's the next lick. Teacher: This example starts in the 2nd box pattern of the D Major Pentatonic scale using a double-stop hammer-on. Later to shift into the bow 1 pattern of the same scale playing more double-stop bends. Here's the last country rock lick. Teacher: This example uses more double-stop bends. Notice how you shift from the 1st & 2nd strings to the 2nd and 3rd strings. The double-stop bends are a little tough to get the correct bend pitch. Using this technique while playing other scales would be a good exercise.